Audrey was the captain for her national team France in this long stage race across France. She won stage 5 in brilliant style, and was set to be on the GC podium, but a late crash in the last stage put her on 4th place. Another proof on Audreys progress in 2014. Claudis Lichtenberg (Giant Shimano) won the race. On a beautiful day in Bretagne we succeeded with our tactics – be patient and attack when the field tired in the hard course. Siri, Tone and Sara did a good job in the first part to reel in the attacks. Sara Olsson did the race of the season and her place in the break was spoiled by a mechanic on a critical time. Audrey and Elisa attacked on the 6th round and managed to get loose from all followers and catched the solo rider Bravard (Futuroscope), only to leave her behind up the hill towards the finish. The duo cruised the last round and finished hand-in-hand – Elisa just taking care so Audrey would win on home soil. 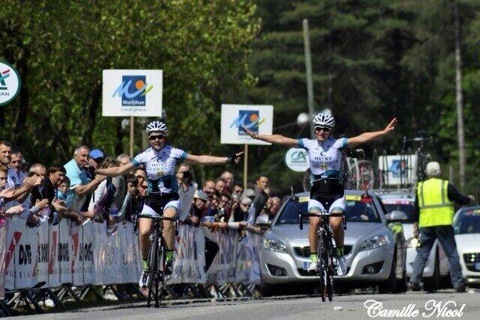 The first double UCI win for the team ever.